Why Install Glass Fireplace Doors? Glass fireplace doors add a decorative element to your room, unifying the design of your room and accentuating your fireplace - the focal point of the room. 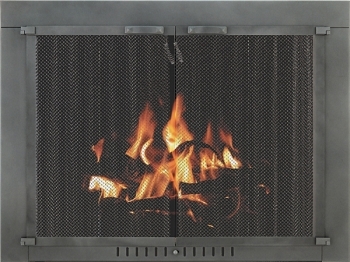 Any open burning fireplace can benefit from the beauty and practicality of glass fireplace doors. An open damper is the equivalent of leaving a window open all winter; being able to close the glass doors when the fireplace isn't in use can save hundreds on your heating bill. 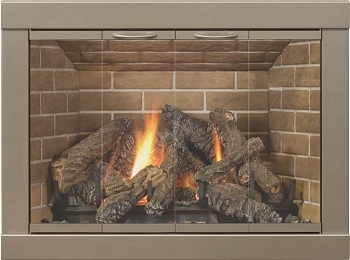 Wood burning fireplaces need glass doors. As the wood fire burns down in the evening and you're faced with waiting up for the fire to die down completely or going to bed and leaving the damper open, you can close your glass doors to help stop your heat from being sucked up the chimney. If you've ever woken up to a frigid cold house the morning after leaving your damper open then you'll understand the practicality of glass doors! Gas log fireplaces need glass doors too. All vented gas logs come with a damper clamp to keep the damper open FULL TIME as a safety measure against burning the gas logs with a closed damper. (Unlike a wood fire that smokes up the house if you don't open the damper first, gas logs don't emit smoke and therefore require a permanently open damper.) So you're not heating the whole neighborhood all winter long, glass doors are closed while the fire isn't burning to keep your heat in the house. We offer a huge variety of glass doors in a style and finish to suit any home. We've added some styles to our website to make nice quality glass doors available even if you don't have a fancy fireplace store near where you live. We've tried to make the instructions simple, but unless you design glass fireplace doors for a living it's easy to get lost in the process. You are most welcome to call us with your fireplace dimensions and tell us what you have in mind and we'll gladly design a door just for you! 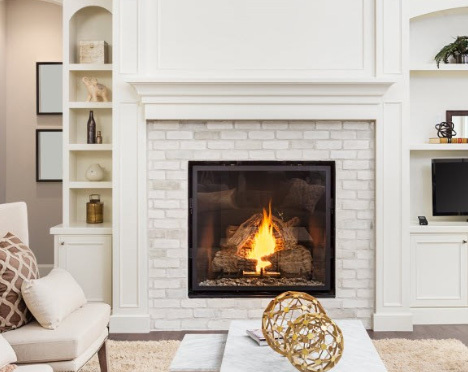 We even offer a great service where you can email us a picture of your fireplace, along with the dimensions, and we'll create a magic photo of your fireplace with the glass doors installed, assuring you're going to love what you order. Hint: squat down and take a nice, head on and level picture for us. 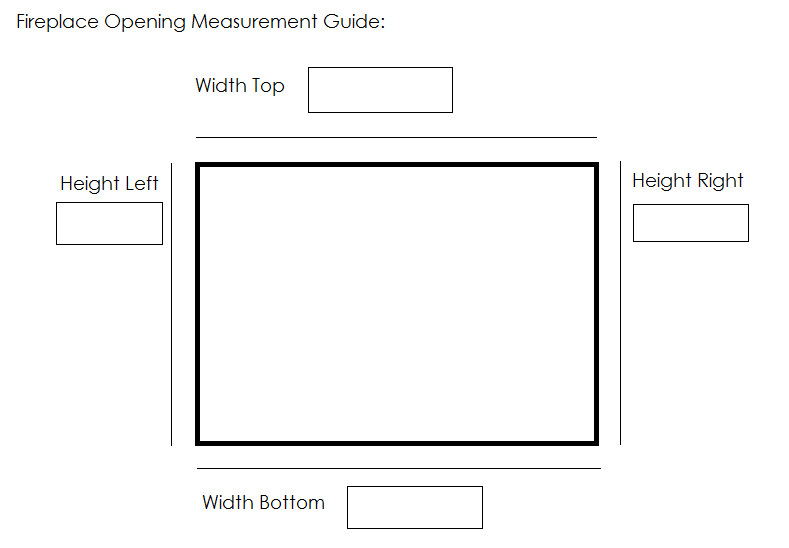 Measure your fireplace opening twice in each direction. The fireplace opening may LOOK square but not be, and it really can make a difference in whether they fit right or not. Above is a little cheater diagram you can use.